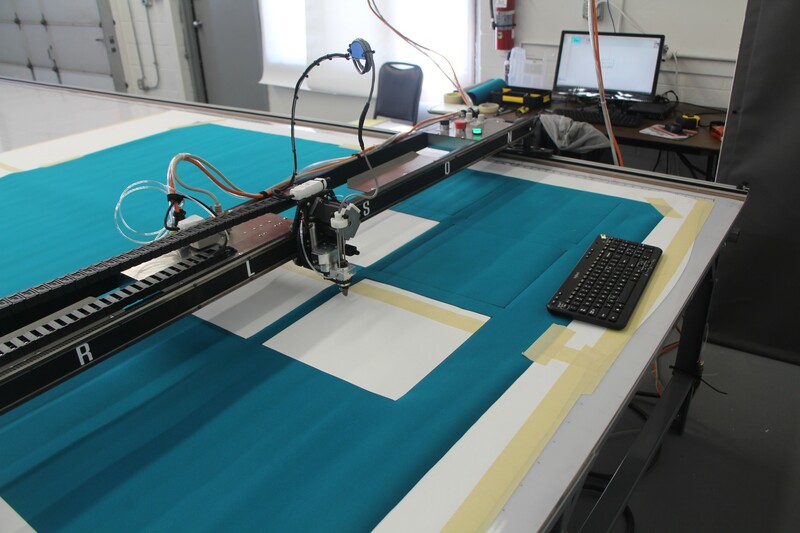 "A small team of expert awning makers automate their cutting process with the Carlson Design PT-72" Plotter/Cutter machine. Specializing in traditional striped awnings, awning-style door enclosures and awning storage in South Holland, Illinois." 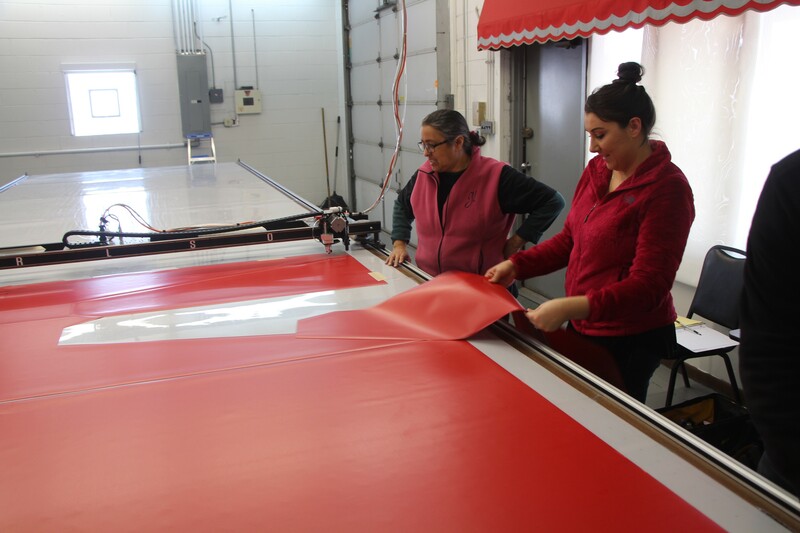 Chesterfield Awning, with their main location in South Holland, Illinois, has been crafting custom awning solutions for businesses throughout the state of Illinois and beyond for the last 59 years. 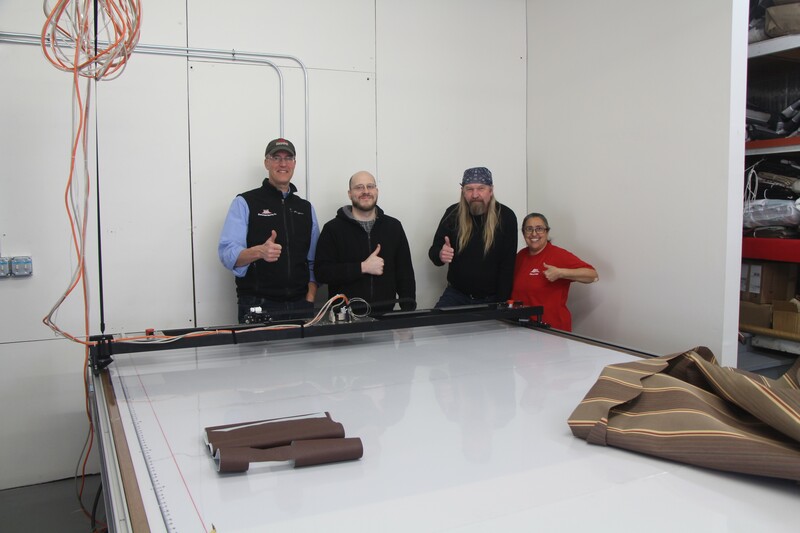 Owned and operated by Dave Ausema, he and his team can measure, quote, cut, and fabricate even faster with a Carlson Design Plotter/Cutter installed in-house and operated by their lead graphics and digital pattern designer, Matt Coglianese. 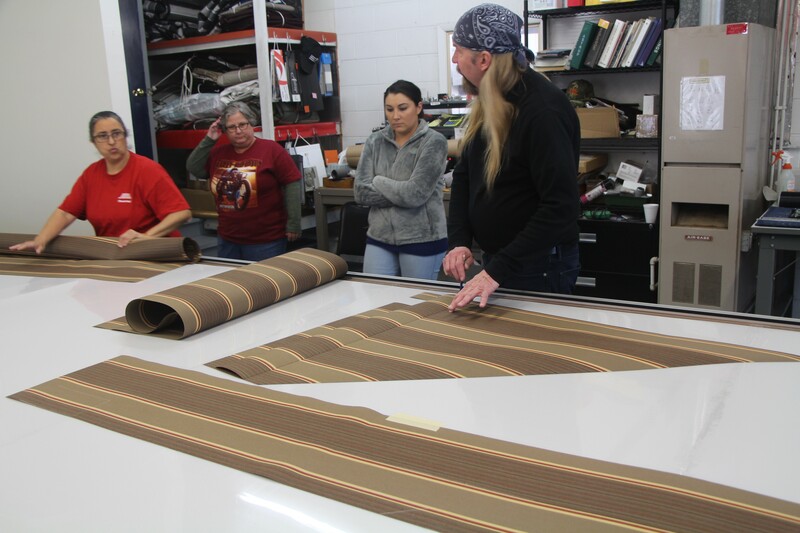 Chesterfield mostly fabricates traditional-style awnings, utilizing Sunbrella and vinyl material with and without striped patterns while also providing storage solutions for seasonally hung awnings. 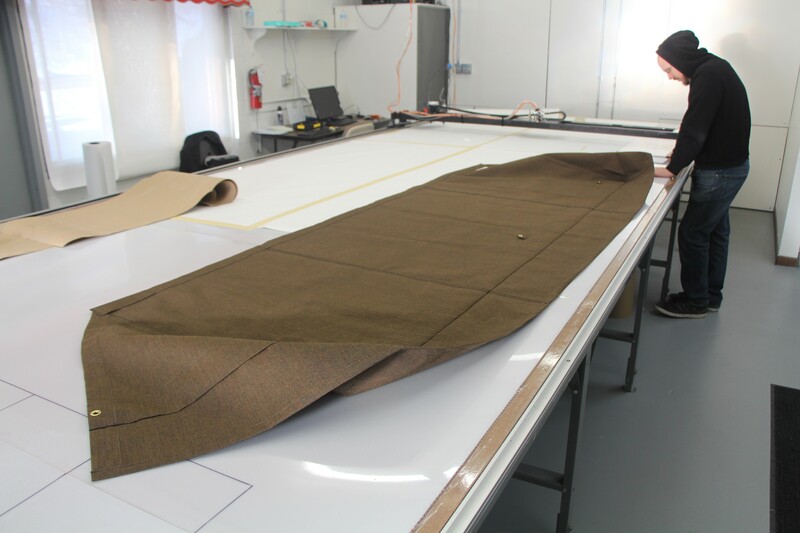 With a small team of sewers lead by the operations manager, Steve, most of their time is spent taking in measurements and converting those to templates, then cutting the templates out of paper, then tracing the pattern onto the desired material and finally cutting the material by hand. 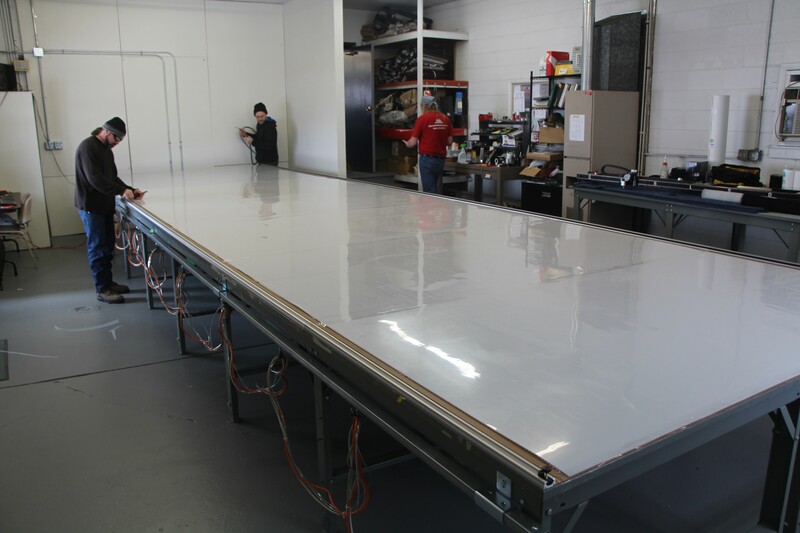 As you can see, there is room for improvement in efficiently preparing material for the awning frame, and that’s exactly what the Carlson Design PT-72″ offers. Ready to automate? Let us help. Click the button below and submit the form to get started with your customized solution today! What was unique about this install? 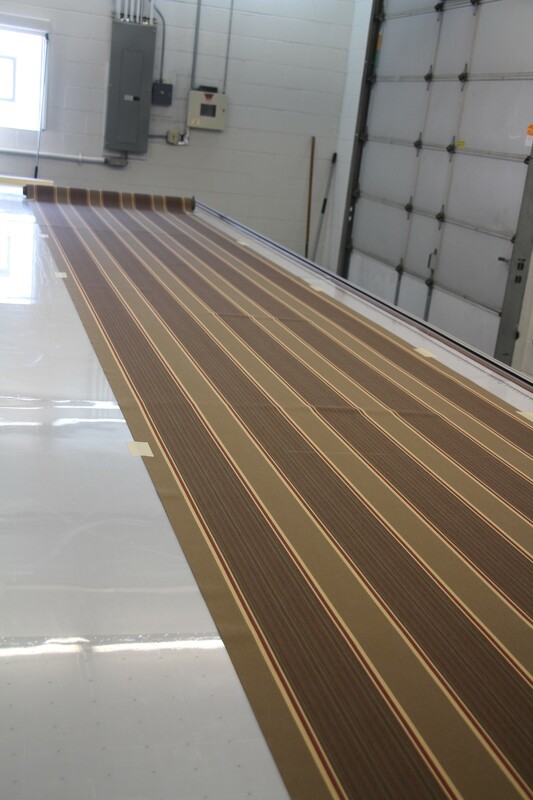 Chesterfield’s awning products come in a wide array of material, some of which is striped. Striped material poses a unique hurdle in the drawing and nesting of patterns. Due to the attention of detail in their products, the striped material must be continuous around the entire awning valance. 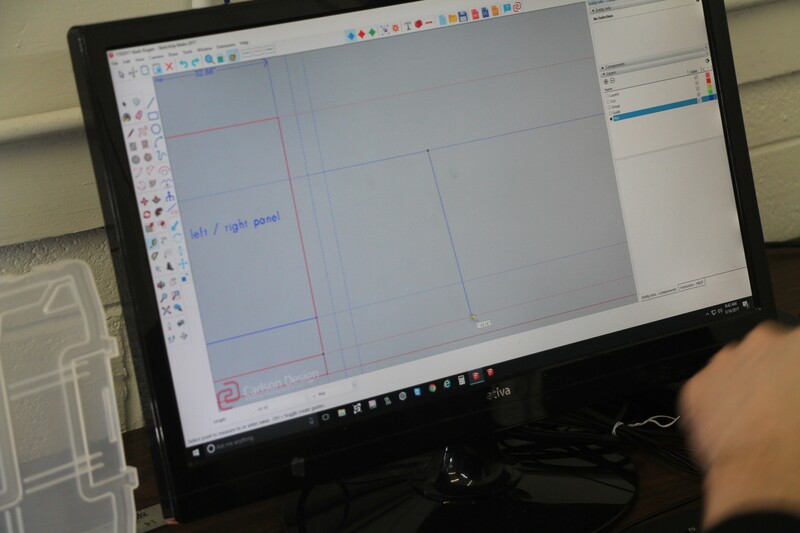 Matt, the lead graphics designer, works closely with the operations manager to ensure the measurements and offset are correct. Some simple guide lines in Sketchup (their choice of patterning software), makes for an extremely simple nesting process using Carlson Design’s proprietary software, Plotmaster. We quickly switch over to the hot-knife attachment. 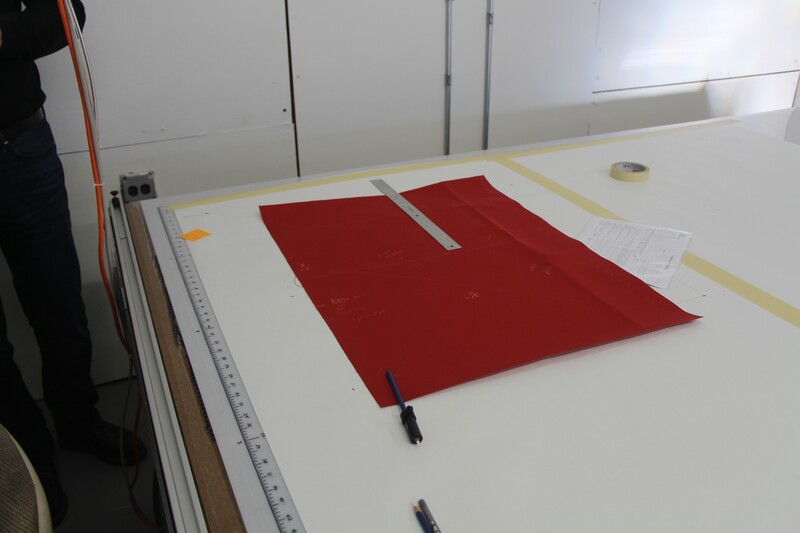 We start with some basic squares for calibration and familiarize ourselves with the tool. 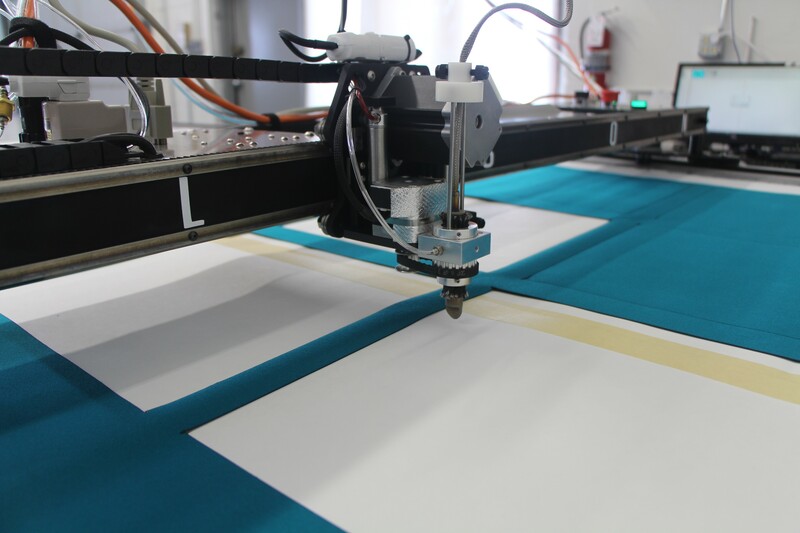 The hot-knife attachment is calibrated by adjusting speed and pressure of the cutting head. 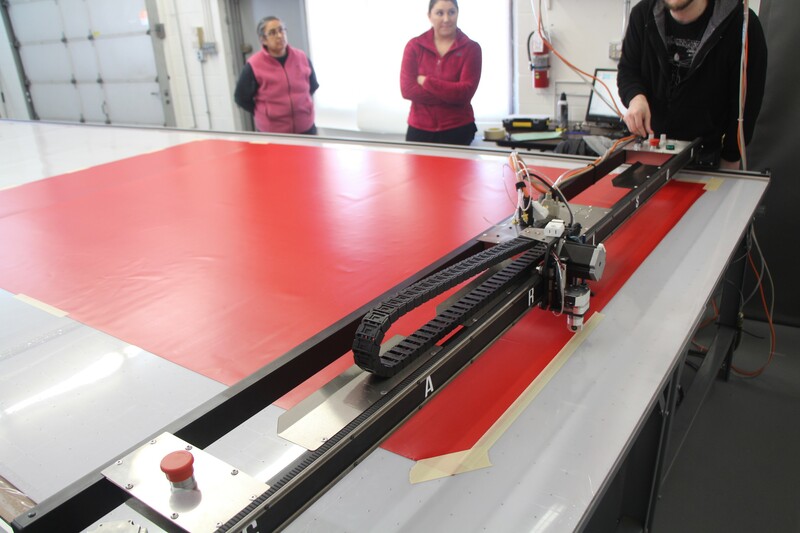 Once dialed in, we can now cut and seal the edge all in one pass. 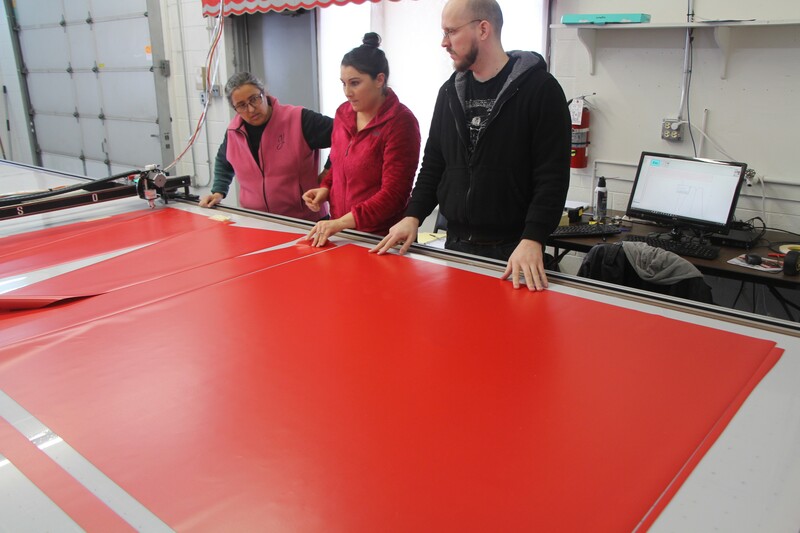 Once the machine is set on it’s tracks, we start with a simple cut on some red vinyl. A basic triangle awning Matt prepared prior to install. Inspecting the first cut. This is one wing of the awning. Looking at the rest of the pieces, the team seems satisfied. 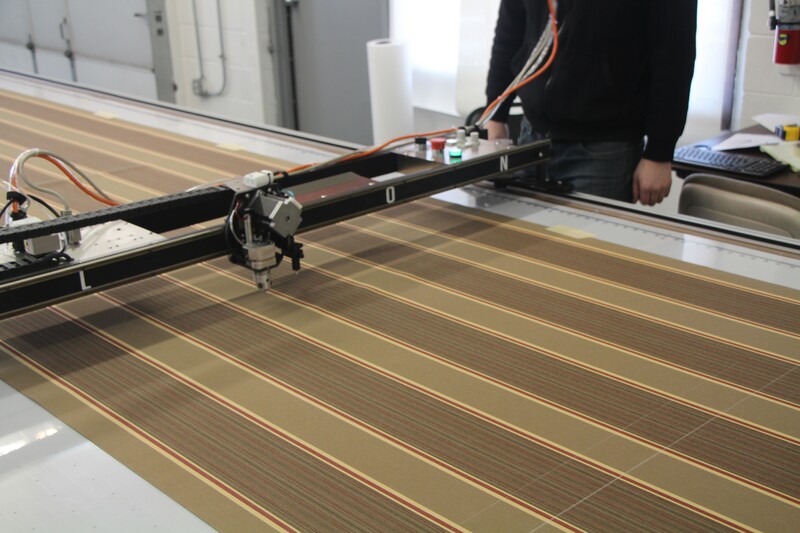 Turning the awning fabric patterning and cutting process into a matter of minutes, rather than days, is a true benefit to Chesterfield Awning. Beautifully cut and marked patterns are now much easier to produce using the Carlson Design tools. 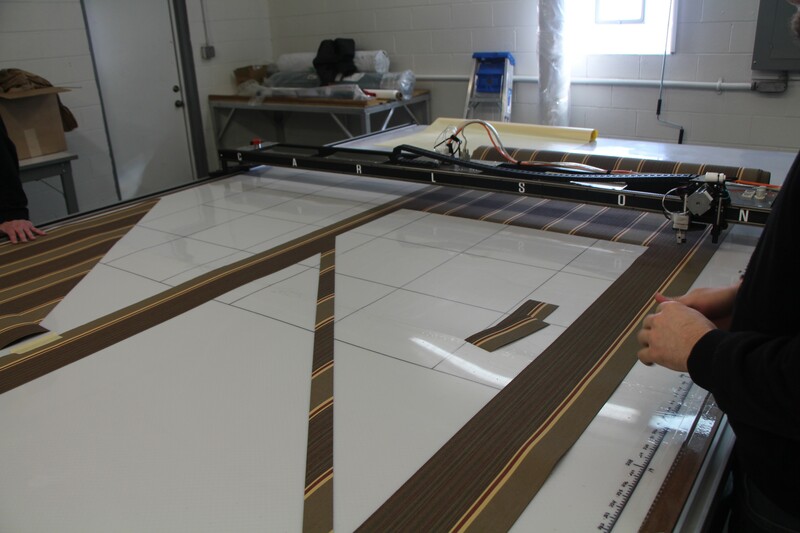 Click through the images above to see the entire process, from install to production cutting. Now we prepare to digitize an awning using Sketchup and Carlson Design’s plugin. Taking some measurements before moving to Sketchup. Once in Sketchup, creating the panels and wings for the awning is as simple and point and click. We now prepare to cut our pattern on some striped Sunbrella. 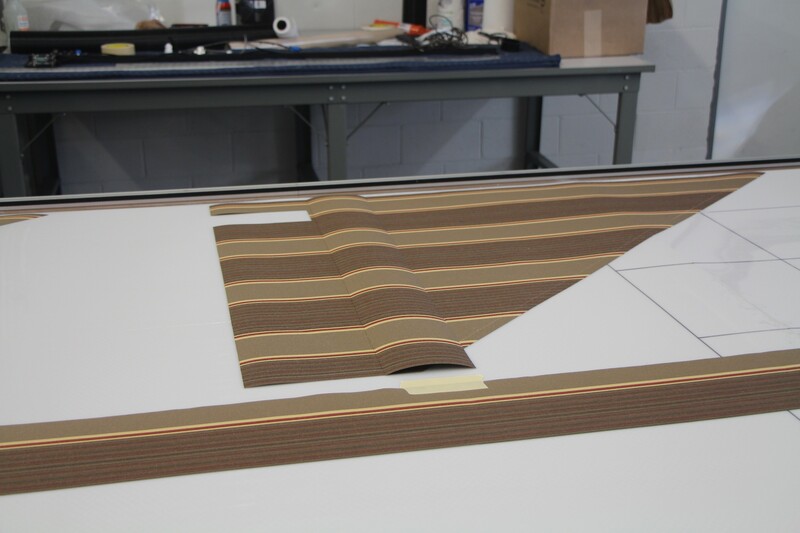 While nesting our pattern in Carlson Design’s Plotmaster software, we account for the striped pattern and it’s repeat. Inspecting our newly cut awning. That’s a job well done! 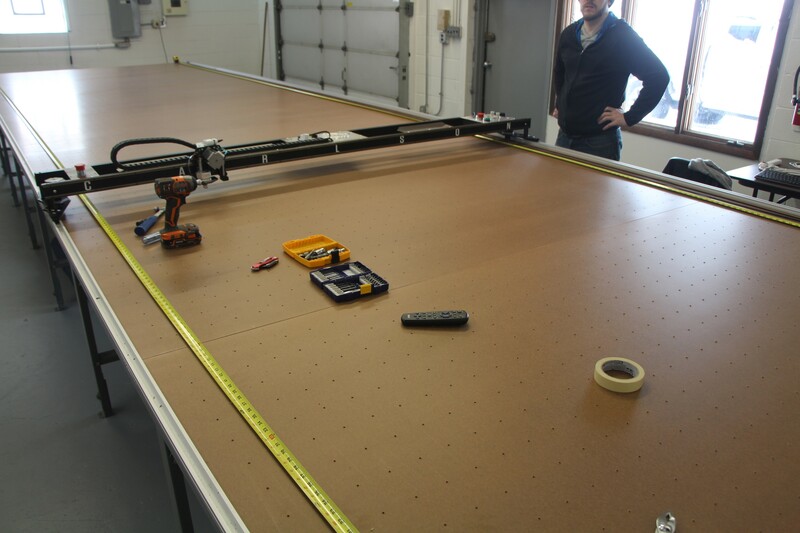 Preparing to install the track, cutting surface and mount the machine to the Phillocraft table. Looking down the edges of the table to ensure the table is laying flat. Any high spots or dips can cause issue, but the Phillocraft table makes it easy to adjust. 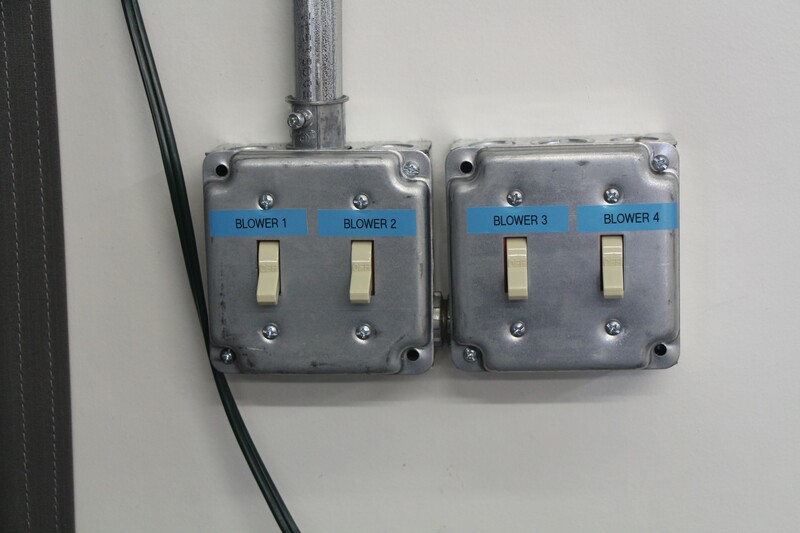 All blowers wired to a 20 Amp breaker and switches installed near the operators corner of the table. 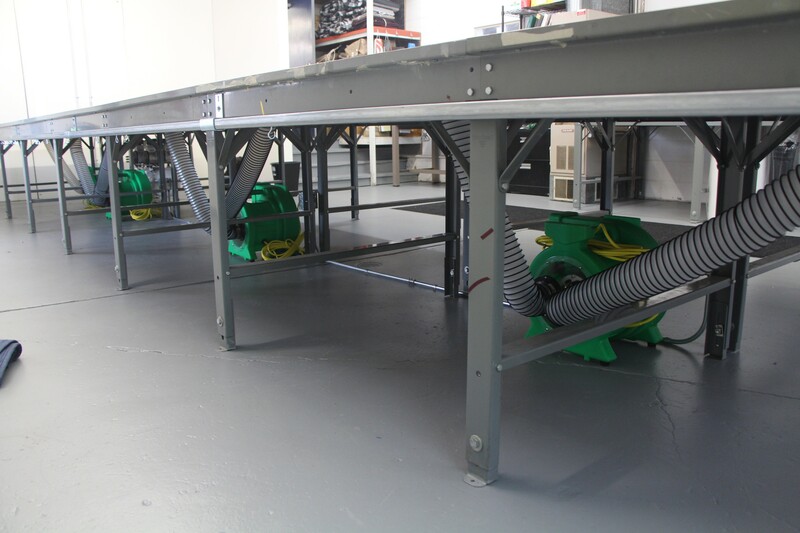 4 x 1.5 HP radial vacuum blowers plumbed to the bottoms of the Phillocraft table tops. 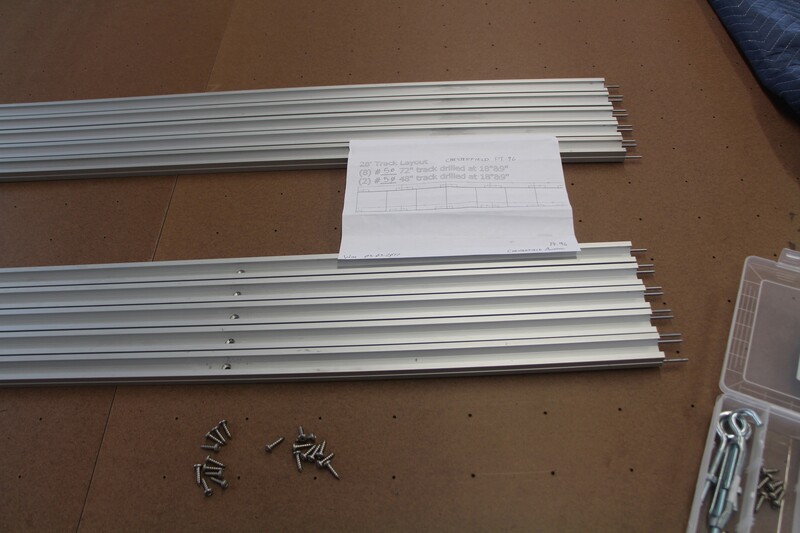 Carlson Design custom extruded aluminum track ready to be installed to the Phillocraft table. 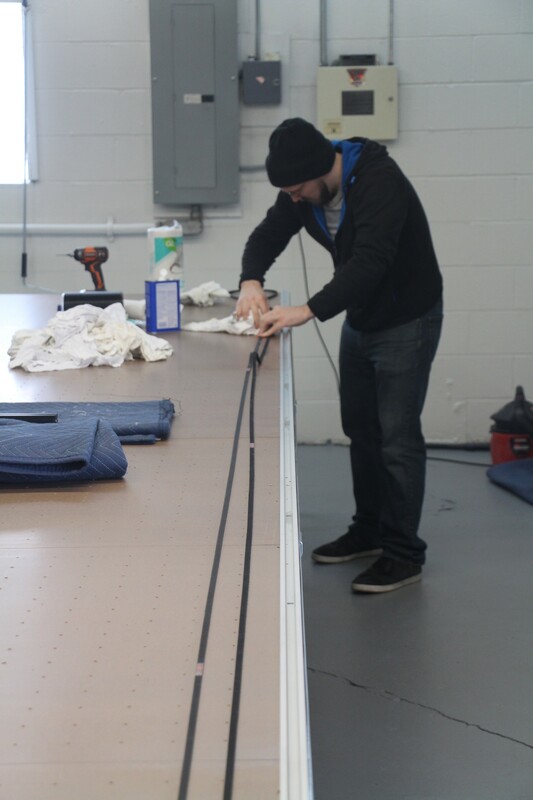 Matt helping prepare the drive belt that will be adhered to the track and allow the machine to move up and down the table. 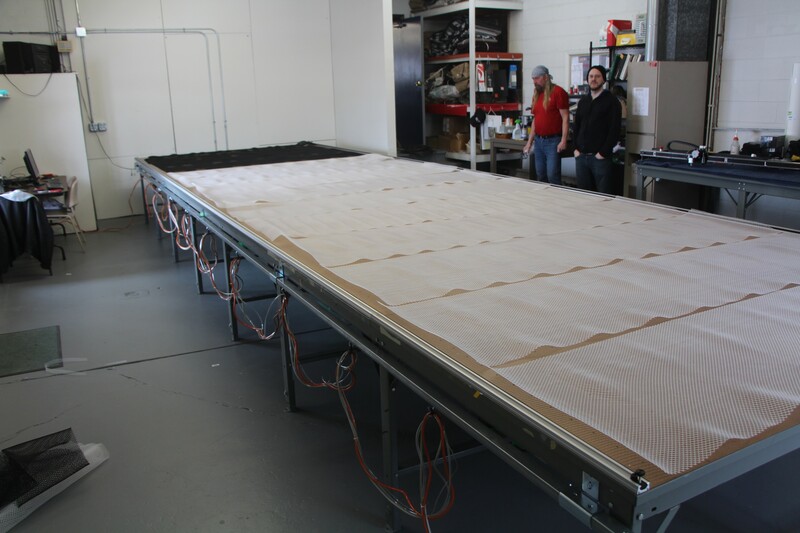 Once one side of table has track installed, we use the machine as a guide to set the track on the other side of the table. 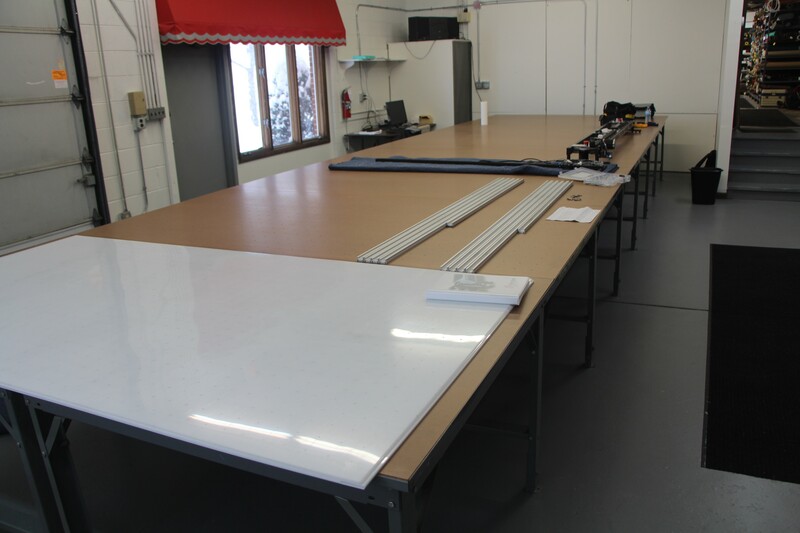 We are now ready for our cutting surface to be laid out and adhered to the table. 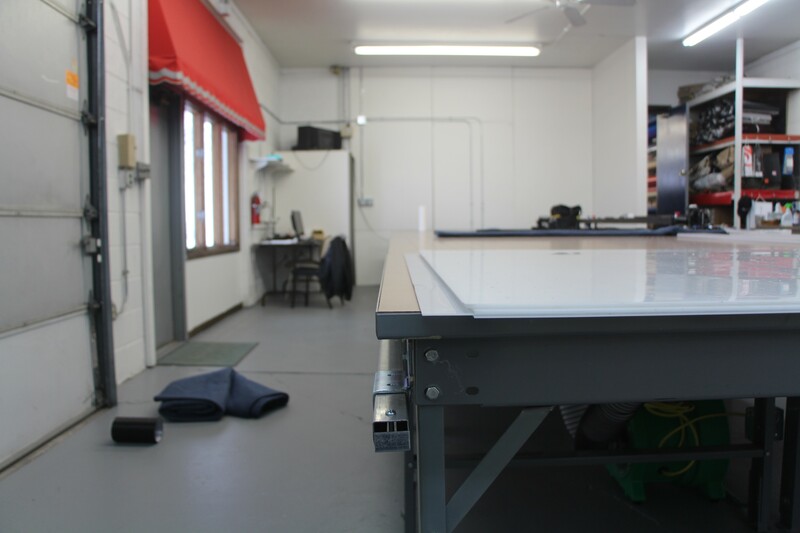 Mesh is used to create an air gap for air to move across the top of the table surface and below our cutting surface. Cutting surface applied, we are now ready to cut!